Get the printable PDF right here. I know, it’s damn awesome. 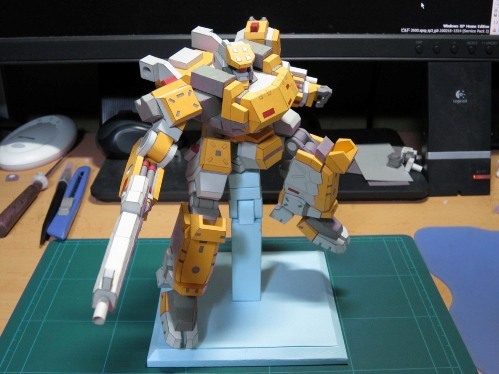 Haha, I remember that post from almost 5 years ago and making that papercraft model as well. This is something i’d really want to try out. Any recommendations as to what kind of paper to use? I think regular bond paper might be a bit too frail for the job. Use something harder man. Oslo? Oslo or maybe cut-up cartolina. Construction paper should work, it’s sturdy, durable (for papercrafting) and it comes in a variety of colors. so this guy goes thru all the trouble of making the design and keeps it all to himself? selfish… i understand that he wouldn’t want someone to duplicate his results and claim they made the template, but damn. Anyone have a working link for this model? hey guys , i just found the link for this model, enjoy!